It’s been 28 days since 280daily officially launched. In total across the site, members have written millions of characters and we have sent out tens of thousands of email reminders. The feedback we’ve been receiving through our internal feedback form, Twitter, blogs, websites and the Chrome Web Store has been unbelievable. It’s reassuring to know that we’ve found a niche and are providing a service that a lot of people have been looking for. We’re hoping to roll out plenty of features before the end of February. It’s great to see so many of these users volunteering themselves to help out. Thanks again for all your support, if you have any feature requests or issues with 280daily, as always, let us know using the feedback form. 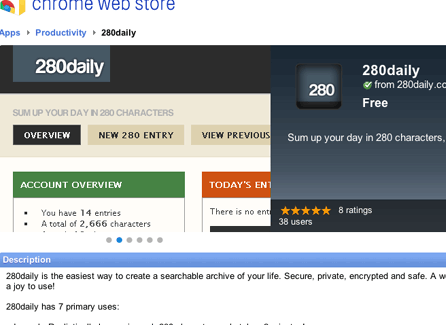 Today one user suggested we submit 280daily to the Google Chrome Web Store. Upon looking into it, we found out the web store isn’t just for native Chrome extensions, but also for online apps (did you know this?). 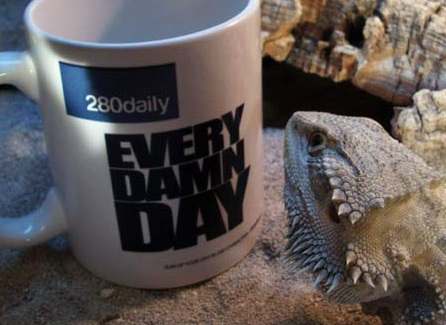 280daily has been submitted to the web store and hopefully it will be another great way of spreading the word. However, just to make things clear, installing 280daily in Chrome doesn’t add any extra functionality, it simply adds an icon to your Chrome dashboard. We’d really appreciate it if you could take the time to write a short review for 280daily at the Chrome Web Store. The majority of 280daily users are browsing with Firefox, which is why we thought it’d be a nice idea to create a Firefox Extension. We’ve almost finished working on it and we’ll let you know when it’s available. It’s a really simple tool that provides a quick overview of 280daily in your statusbar, you’ll have full control, so that you only see the information you want to see. We think it’ll be a great unobtrusive way of helping you keep your archive updated. UPDATE: The Firefox extension is no longer being developed as we don’t have the resources to introduce an extension for all browsers, so it doesn’t make sense at this point to maintain a Firefox extension. If you already have the extension installed it will continue to work for the foreseeable future.